Simple Steps To Keep All Your Personal Data Safe On Facebook! Instead of deleting your Facebook account, you can make some changes to your settings to make your account more secure. Facebook is in a deep mess right now, and people around the world are going crazy about the data scandal. WhatsApp co-founder Brian Acton is even urging people to delete Facebook. But, will deleting Facebook solve all your data privacy problems? Do you think that Facebook doesn’t have a database with all your data already? And Google collects your data too! So, deleting Facebook is not the solution. The answer is to stay smart and stay alert on the internet. You need to be very selective about your exposure on social media and with the data you want people to see and also what data you are letting third-party apps and services use. Instead of deleting your Facebook account, you can make some changes to your settings to make your account more secure. Facebook will not leak your private data, but the third-party apps connected to the social network may. We often give such apps the access to our private data and information, often unknowingly. It is with the access like this that the data may get compromised and give others an opportunity to misuse it. But, you can revoke the access of these third-party apps and regain control over your personal information. 1 How To Stop Third-Party Apps From Accessing Your Profile? How To Stop Third-Party Apps From Accessing Your Profile? The first thing you need to do is to remove the app from your Facebook account. Follow the steps to retract your personal data from your Facebook account. This cannot be done through the Facebook app, you will need to log in to Facebook’s desktop site. Log in to your Facebook account and click on ‘Settings’ from the drop-down. Click on ‘Apps’ in the left-hand menu. 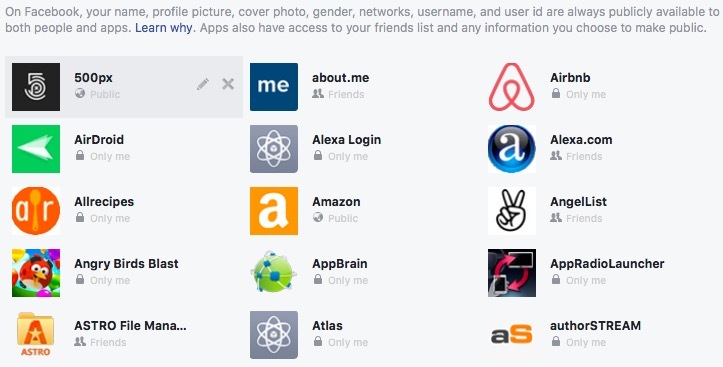 You will see all the apps which can access your Facebook data. If you hover your mouse pointer over any of these apps, you will see ‘Edit Settings’ and ‘Remove’ options. If you want to see all the permissions the app has, click on ‘Edit Settings’. If you want the app to stop accessing your Facebook profile altogether, click on ‘Remove’. Deleting the apps or modifying their permissions is only the first step. Here are a few additional things you need to do to be safe on Facebook. It’s a one-step, easy process to log in using your Facebook credentials. But, here you are again allowing the third-party service or app to access your data. 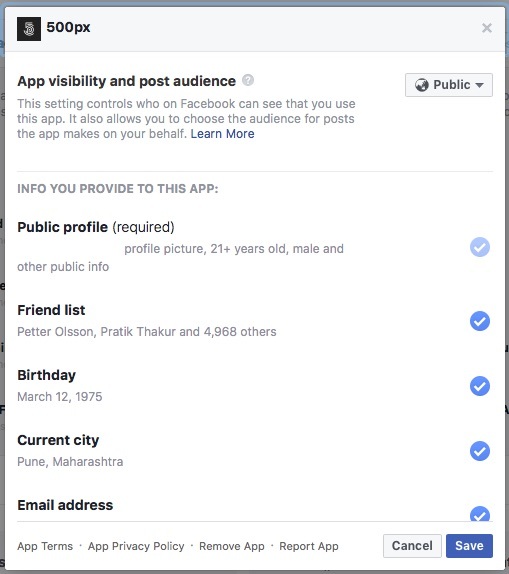 If you still need to use your Facebook account for some applications you trust, limit the access with minimal options like Bio and Name. Uncheck all the other boxes. After you allow access to an app, it keeps tracking you even if you are not using it anymore. It’s better to disconnect the apps you don’t use anymore and stop them from tracking your data and every move. Facebook doesn’t need to know about your recent check-in at CCD, and neither do your friends. Stop broadcasting your every move on social media. Be very selective with what you are putting in your profile and sharing with total strangers. Facebook tracks your activities around the web and across devices. So use a blocker like uBlock Origin to safeguard your data. Follow these simple steps to keep your data safe online. A little bit of common sense and proactive monitoring go a long way to keep you safe from opportunistic crimes. Stay alert, stay safe! "Simple Steps To Keep All Your Personal Data Safe On Facebook! ", 5 out of 5 based on 3 ratings.